vRouters are required as the networking foundation for uCPE solutions. 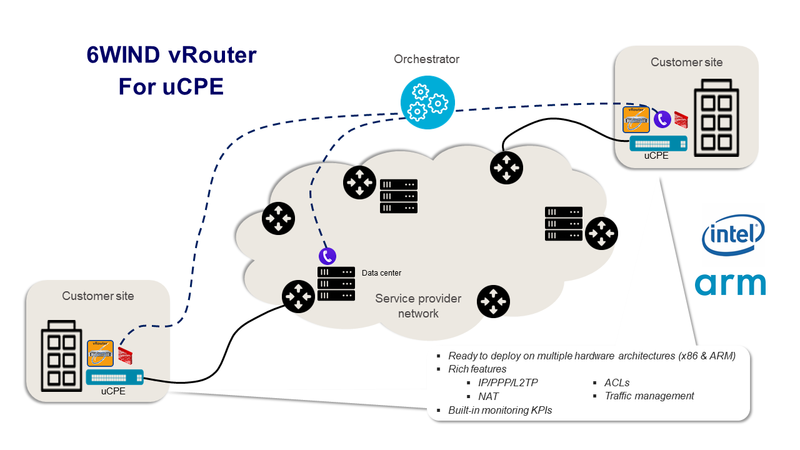 In today’s market, vRouters must be ready to deploy on multiple uCPE architectures including x86 and Arm. vRouters should include rich features as required by uCPE use cases including IPoE, PPPoE, filtering, NAT, QoS, IPsec VPN, traffic management and much more. vRouters should also include the correct APIs for built-in monitoring Key Performance Indicators and third-party orchestrators. Here’s an example of a 6WIND vRouter in an x86 uCPE use case on Intel Atom processors. We conducted a test on an Atom C2000 platform running multiple vRouter features including bridging, routing, NAT and QoS with WAN and LAN features. Using 1 core, we compared 6WIND’s vRouter versus standard Linux on 1 core. 6WIND achieved 1 Gigabit per second of bi-directional traffic while Linux achieved only 150 Megabits per second. Performance is critical for uCPE total cost of ownership (TCO). If your uCPE requires 1 Gigabit per second, 6WIND achieves this in a 2 core Atom processor using 1 core for the data plane packet processing and 1 core for the control plane. For Linux to achieve 1 Gigabit per second, you would need an 8 core processor. 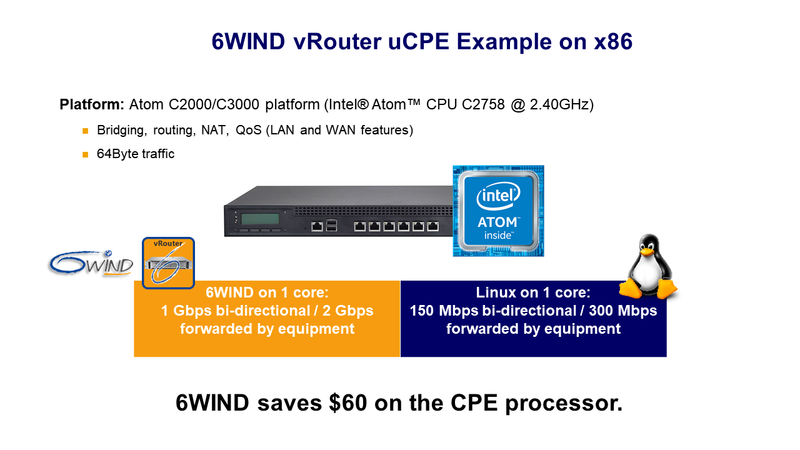 In the case of 6WIND vRouters, uCPE vendors can enjoy savings of around $60 per CPU processor. At Mobile World Congress Barcelona 2018, Telco Systems, Marvell, 6WIND and Trend Micro demonstrated an Arm-based uCPE solution with Zero Touch Provisioning. This demonstration shows how to seamlessly add a new customer to the network. 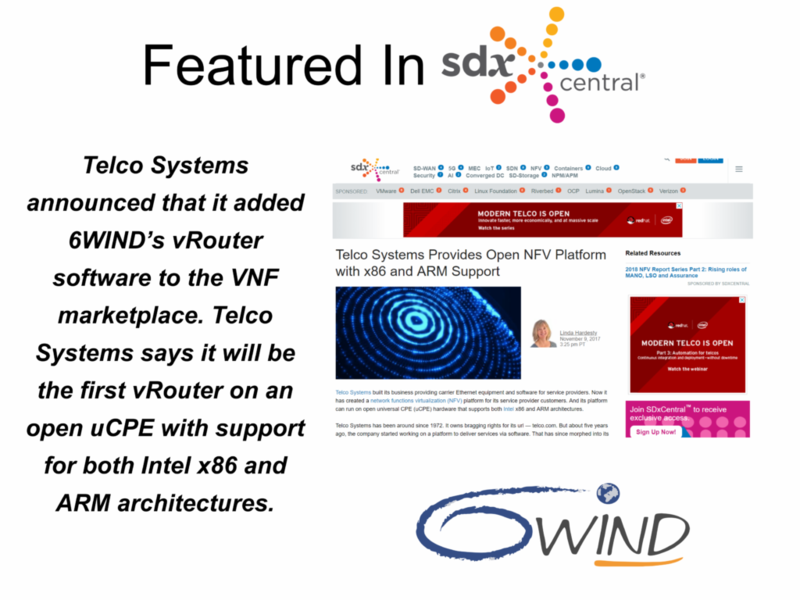 Telco Systems’ NFVTime OS facilitated the entire process of deploying 6WIND’s vRouter onto the uCPE, demonstrating automated management and orchestration for uCPE services.